In the wake of the 25 January revolution and the coup that followed in 2013, Egyptian bookstores recorded a significant increase in demand for books by and about the Muslim Brotherhood. However, despite the burgeoning literature on the Brotherhood, knowledge about the movement is still rather limited, particularly with regard to its most strategic tool – media and communications. This book offers a fresh and close look into the communication strategy of the group, focusing on published periodicals, biographies, and websites that represent the voice of the Brotherhood. The book analyses the core mission of the Brotherhood, namely its daᶜwa (call, invitation to faith) – how it is articulated and how it is defined by the movement as an ideology and a process. Have the media represented a coherent voice of the Brotherhood over the past decades? What can they communicate regarding the Brothers’ perception of the needs of their audiences? How have the media served to sustain, preserve, and distinguish the movement for nine decades? The book argues that the Brotherhood media speak with an intermittent voice and deliver an incoherent message whose tone is changeable and fluctuating and cannot be claimed to truly represent the heterogeneity of the group. 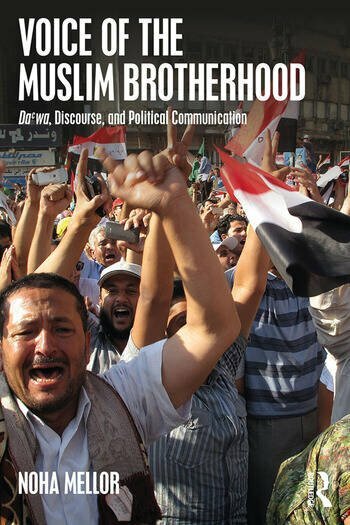 Adopting an interdisciplinary approach that integrates Media Studies and Social Movement Theory, the book provides a fresh analysis of the Brotherhood movement as an interpretive community and will be a valuable resource for anyone studying Egypt or the Muslim Brotherhood. Noha Mellor is Professor of Media at the University of Bedfordshire, UK, and Adjunct Professor of Middle Eastern Studies at Stockholm University, Sweden. She’s the author of several volumes about Arab media and culture. Voice of the Muslim Brotherhood is a meticulous examination of the contents of the various media outlets associated with Egypt's Muslim Brotherhood. Beyond demonstrating the variability of the viewpoints expressed by its spokesmen over time, the study's attribution of the organization's survival as a movement, despite repeated persecution, as deriving from its being an "interpretive community" with a common anticolonialist worldview and shared practices rooted in Islam is a powerful one. Throughout decades of opposition and repression, the message of the Muslim Brotherhood continued to appeal to large segments of the Egyptian population. The movement dynamically used all media at its disposal, from books, magazines, and pamphlets to internet sites. Noha Mellor has admirably unraveled its media strategy, which makes her study vital for historians, social scientists, and media researchers seeking to understand modern Egypt and its Islamist movements. In Mellor’s discourse analysis, one can see that modern Egyptian politics reflected a religionized secularism and a secularly conscious religious discourse that was and is a synthesis of religion and the secular. In an important way, political modernity in Egypt, as shown in Mellor’s study, is a “seculigious” modernity and raises questions about whether or not modernity itself is necessarily secular" (...) Noha Mellor presents significant in-depth analyses of the content of Muslim Brotherhood discourses with extensive translations. At the same time, she provides an important contribution to the broader understanding of the relationships between the secular and the religious in the discourses of modernity.